You told your bargaining team you want wage parity with full time support. You want benefits. You want sick time and vacation entitlement. You want education benefits. You also told us you want a fair hiring system that recognizes your skills, experience and education. Your bargaining team heard you loud and clear, and we are moving forward with those demands. Fairness includes parity with the full-time support staff on monetary items. We have an excellent model document to work with – the College Support full-time collective agreement – and that’s what we’re using. The Employer agreed to these terms for the full-time workers, now it’s time for them to agree to the same for the part-time workers. The Employer wants “operational flexibility” and we have heard those words a lot at the bargaining table. This is their way of saying no: No to fairness, no to equality and no to your priority demands. 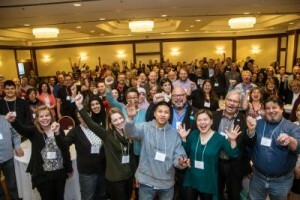 We remain determined to reach a fair collective agreement, and we’ll get it with your support, together with cooperation and good will from the Employer. Get informed on the issues, talk to your co-workers, and take part in our upcoming bargaining support actions. Support your bargaining team! They have goals. We have demands. We did our homework and came to the bargaining table prepared. Really prepared. On the very first day we came to the table with a full package including your prioritized demands, a draft proposal for a collective agreement, and all the research to back it up. What did the Employer have? Goals. They brought five goals. Count them. Just five. Their actual bargaining intentions are hidden between the lines. The Employer’s number one goal is “operational flexibility”. We have had 50 years of operational flexibility. That’s how we got here. That way of running Ontario’s colleges has created systemic disrespect for part-time workers. College Support Part-time workers organized and joined OPSEU to take a stand for workplace fairness. We see through the employer goals and double-speak. You told us you want change, and your bargaining team is committed to delivering. We are at the bargaining table to put an end to decades of the Employer devaluing our work. You told us you are done with the Employer’s 24 different systems of hiring, determining wages, and writing job descriptions. You told us to negotiate for a different system that is fair for all. And that is what we are doing. 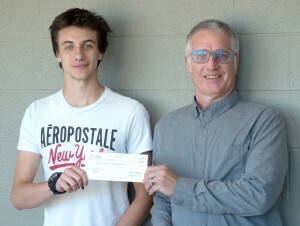 Congratulations to Luke Bonsi, a first-year Electrical Engineering Technology student at Georgian’s Barrie Campus, who won a $1,200 scholarship this year from the Colleges of Applied Arts and Technology (CAAT) Scholarship Fund. The CAAT support staff division offers annual scholarships to full-time students at any of the 24 colleges. This year, five $1,200 scholarships were given out. Students have to submit an essay based on topics ranging from the importance of unions to bullying and harassment. Local 349 President Craig MacKenzie presented Luke with his cheque on June 21. This is the second time a Georgian student has won one of the scholarships. Last year, Alessandro Simonetti, a student from the Owen Sound Campus, won a scholarship. 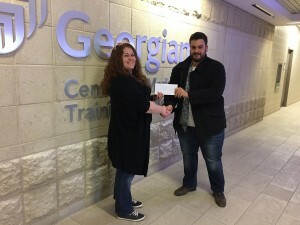 Local 349 steward, Kailey Hawkins, presented Alessandro with his cheque. Smokey Thomas has been re-elected as President of the Ontario Public Service Employees Union for a sixth consecutive two-year term. He was first elected to the union’s top post in 2007. Thomas defeated Myles Magner, OPSEU Regional Vice-President for the Toronto area. Eduardo (Eddy) Almeida, a correctional officer from Hamilton, was acclaimed for his fourth two-year term as First Vice-President/Treasurer yesterday.